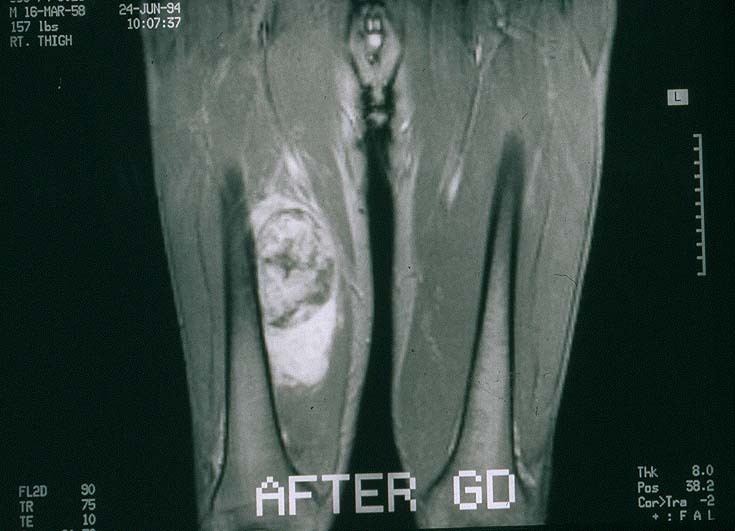 A 30 year old man presented with a mass in the inner thigh.� MRI disclosed an enhancing, heterogeneous mass in the thigh, abutting the femur (image #1). 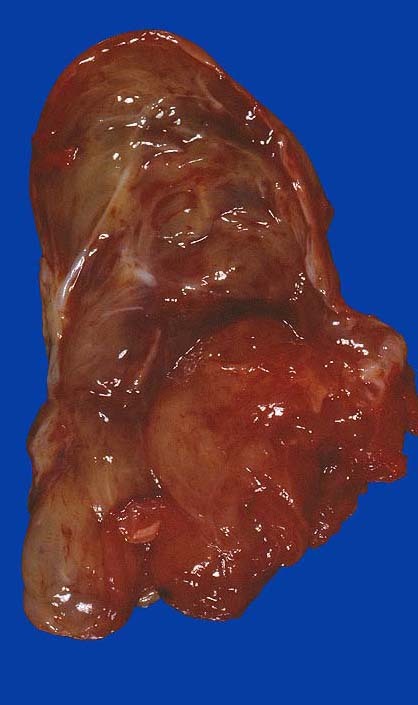 Following open biopsy, he was treated with adriamycin-based chemotherapy, and the tumor was resected.� Grossly, it was largely gelatinous, but had areas that appeared fleshy (image #2).� Eighteen months later he developed recurrent disease in the groin, and he ultimately died of disseminated disease. Micro description:� The tumor showed variation from field to field.� Some of the tumor was relatively hypocellular with myxoid stroma, low grade nuclear cytology, plexiform small vascular pattern, and readily identified signet ring type lipoblasts (image #3).� However, most of the tumor was more cellular, consisting of closely-spaced, overlapping, anaplastic round cells with scant cytoplasm and readily identifiable mitotic activity.� These areas had very little stroma, and much fewer lipoblasts (image #4). 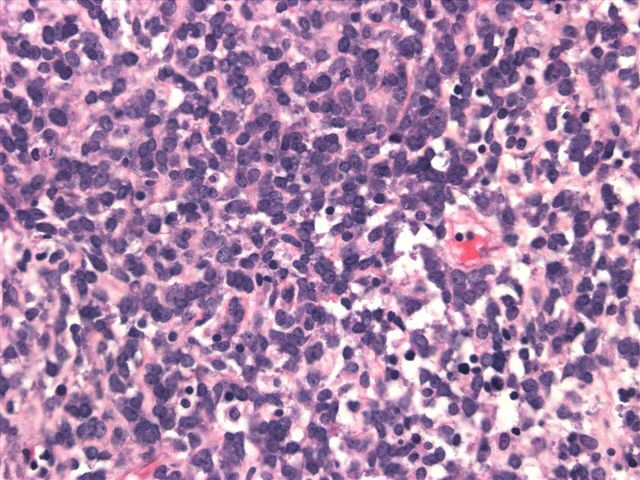 Myxoid and round cell liposarcomas, although histologically different, actually represent two ends of a spectrum for a tumor which almost always has the same translocation, t(12;16)(q13;p11).� They are common, and together account for 50% of all liposarcomas.� Tumors with pure myxoid features are considered to be well differentiated, and to have a good prognosis.� However, round cell features are considered high grade or poorly differentiated, and are associated with a poorer outcome, even if they represent as little as 5% of the tumor volume.� Thus, apparent myxoid liposarcomas should be sampled thoroughly to ensure that no significant round cell component is present.� This is a particular problem with needle biopsies, which may entirely miss the round cell component. 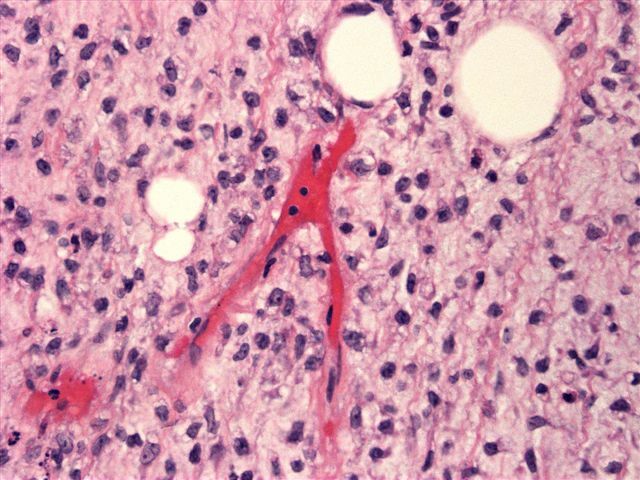 Histologically, pure myxoid liposarcomas resemble developing fetal adipose tissue, with a multinodular mass of low cellularity, particularly centrally.� The tumor cells are bland, spindled or round, and lie within a myxoid matrix.� Numerous lipoblasts are present, with one or many vacuoles.� There are no/rare mitotic figures.� A delicate plexiform vasculature is present, and helps differentiate this tumor from myxoma. The round cell component is often separated from the myxoid component by a cellular transition area.� The round cells are primitive, with minimal eosinophilic cytoplasm, a high N/C ratio, and prominent nucleoli.� Lipoblasts are less frequent than in myxoid areas.� Often the cells are packed together with minimal stroma, and blood vessels are difficult to find. As noted, almost all myxoid/round cell liposarcomas share a common t(12;16)(q13;p11) translocation resulting in the TLS-CHOP fusion gene.� Less common is t(12;22)(q13;p11) or an insertion between chromosomes 12 and 16, (12;16)(q13;p11.2p13).